District Climb debuts the tough workout in West Village. One of the most daunting things about taking a VersaClimber class is not really knowing how a VersaClimber works. I watched countless Instagram Boomerangs and read articles about what a class entails and still wasn’t at all sure what was going to happen when the music got louder and the lights went dim. “The VersaClimber is very intuitive and it shouldn’t take you more than a couple songs to get the hang of it,” says District Climb founder Tamra Freedman. It’s sort of like climbing a never-ending ladder to the beat of a Demi Lovato remix. Depending on the music, you’ll make small movements quickly, or longer “reaches” when the beat slows down. The most similar workout is a spin class. Particularly one with a more club-like atmosphere (i.e. SoulCycle, The Ride House, or Cycler). 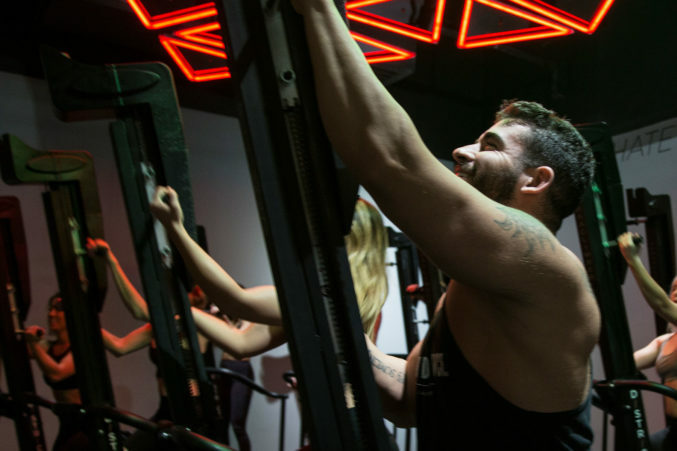 Both District Climb and Rise Nation offer three class levels, including an intro class to help you get a feel for the VersaClimber. You absolutely want to take this class. Sometimes, it’s fine to skip an intro class. You’ll survive an intermediate yoga class without first taking a beginner’s lesson. But jumping into an intermediate VersaClimber class without experience seems akin to skiing down a blue square hill when you’ve never even been on a bunny slope. I’ve done that and I’m still traumatized. There’s so much going on aesthetics-wise, and the machine is so low-impact (more on that in a sec), that there were times I was wondering if I was really working anything. The cardio was on point though — we were all sweating almost instantly and I was definitely out of breath between songs. But I wasn’t sure I had really worked any muscles, until about an hour after the class when my arms were uncontrollably shaking as I typed a text. Also, the next day I was sore all over. The good kind of sore though, not the kind where you worry that you’ve hurt yourself. But it’s also genuinely fun, so those grueling thirty minutes fly by. Just be prepared for a little shakiness post-class as you work your way up to LeBron-level climbing.